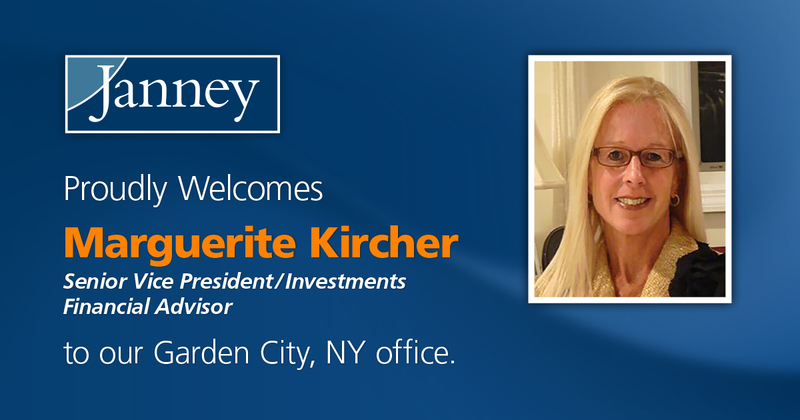 PHILADELPHIA, PA – September 11, 2017– Janney Montgomery Scott LLC (“Janney”), a leading full-service wealth management, financial services, and investment banking firm headquartered in Philadelphia, PA, announced today that Marguerite Kircher, Senior Vice President/ Investments has joined Janney’s Garden City, NY branch office. Kircher was previously affiliated with Wellington Shields & Co.
Kircher is entrusted with over $119 million in client assets. She received a B.A. in Biology/ Chemistry from Sweet Briar College and presently serves on the Board of Regents of the Tomorrow’s Hope Foundation. She has served as Co-chair for the Class of 2017 on the Kellenberg Memorial High School Shepherd’s Fund and previously sat on the St. Rose of Lima School Board, including five years as President of the Board. She was also appointed to the Diocese of Rockville Centre Education Commission where she served on the Finance Committee. Janney’s Garden City, NY branch office is located at 1001 Franklin Avenue, Suite 202, Garden City, NY 11530.